We had spent the first 10 days of our holiday at the Amaryllis Beach Resort Hotel in Barbados (read our report on this stay here) and it was only a short taxi ride from this hotel to the cruise terminal where Ventura, the largest and newest ship of the P&O fleet, was moored. Although we boarded on the Friday afternoon it did not sail until Saturday evening because it takes 2 days to disembark and embark its 3,200 passengers. We spent the remainder of Friday organising and finding our way around but on Saturday we walked into Bridgetown for a last look around and some last minute shopping. The pavement route into Bridgetown from the cruise terminal has been much improved since we last made this trip although there is still a short rough but not impassable section on the route and some kerbs are very high. Our adapted cabin, C301 and balcony, was spacious being 50 percent larger to accommodate wheelchair users. Prior to our departure our travel agent, Travel Counsellors, had tried to obtain a "monkey pole" for the holiday but this proved impossible. P&O offered us a hoist and although we did not require its lifting capability, we accepted this to use as an over the bed "monkey pole". It was easy enough to remove the lifting harness and fit our own trapeze handle. The adapted bathroom with a wheel in hand shower and fold down shower seat was almost perfect. The toilet height of 18 inches was a little low but with our own 2 inch riser was perfect for Wendy. Getting about on board was not difficult once you knew your way around. There were 14 decks accessible to passengers and all doors to open decks were ramped with at least one automatic opening one leading onto the larger decks. However, some sun deck areas were not accessible and some ramps were a little steep. There were four swimming pools and one was equipped with a hoist. None of the jacuzzis were accessible. Access to the theatre, where wheelchair spaces were provided was ramped but was quite steep. 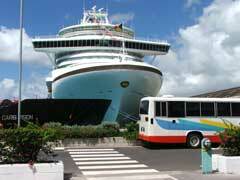 Antigua - The ship berths alongside a jetty almost in St Johns! The tourist shops by the quayside are easily accessible but like most areas of the Caribbean don't expect many dropped curbs and once out of the tourist shopping area it can be a little steep and rough. This was our third visit to Antigua but this time, before our departure, We had arranged to visit the Sandals resort on Dickenson Bay. As it turned out Dickenson Bay is a popular destination for passengers from visiting cruise ships and we were soon organised by a taxi marshal into a group of eight for the US$6 each short taxi ride to the bay. Sandals were very hospitable and gave us free run of this large site which is actually two adjoining sites, that of Mediterranean and Caribbean Villages which form the Sandals Grande Antigua. We found the access around the site and to the bars and restaurants very good. There was also ramped access into the main pool and there were two rooms within the Mediterranean Village suitable for wheelchair users, numbers 7311 and 7310, but we could not view these because they were occupied. However we did ascertain that they still have very high beds and the non ambulant would need further aids supplying. We had a couple of drinks by the pool, declined the offer of lunch, and wandered back to the public side of the bay where there were a couple of beach bars and you can hire beach beds. Here access was not easy for a wheelchair but we parked ourselves by the side of one of the bars for an hour or so and had a couple of beers and a swim while we waited for the pre- arranged return of our taxi back to St Johns. Grand Turk - Again the ship berths alongside a jetty and there was easy access to the cruise terminal shops, Margaritaville bar, swimming pool and the adjacent beaches. It's a sea and sand lovers paradise and there isn't much else to do other than shopping. 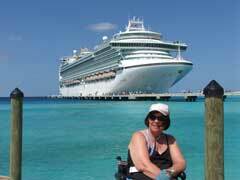 We spent the morning on the beach and then visited the cruise terminal shops before returning to the ship. Catalina Island, Dominican Republic - There is no jetty here and tenders are used to take passengers and crew ashore for a beach BBQ. We were advised it was not suitable for the non ambulant so we stayed aboard to use the ships facilities in peace and quiet. Unfortunately this was the day the deck crew had chosen to do maintenance round the Lagoona Pool, the only one with the hoist, and we had to wait until 2p.m. before we could use it. St Kitts - We were looking forward to going ashore here because a tour using wheelchair accessible transport was available and we had also not visited the island before. Unfortunately it was too windy for the ship to dock and with a worsening forecast the Captain decided to head for St Lucia. St Lucia - We arrived late evening but did not go ashore until the following morning. Again we had arranged to visit the Sandals Halcyon resort which was a US$10 taxi ride from the harbour. We had stayed here before (our reprot can be read here ) and we wanted to see if the refurbishment of this resort had improved the wheelchair facilities for the non ambulant. Unfortunately progress has not been rapid due to the need to restrict work to periods of low occupancy and although we were shown some very nice new rooms, these were not suitable for the non ambulant. It is hoped two rooms will be made more suitable on completion of refurbishment? We accepted the hospitality offered and stayed a while longer for a couple of drinks and a snack and then returned to the ship for the afternoon. St Maarten - The ship docks at a jetty and cruise terminal in the Dutch administered part of the island which is about a 10/15 minute walk from the beach and main shopping area of Phillipsburg. We had decided to visit Marigot in the French administered part of the island in the morning and return to Phillipsburg in the afternoon. We had no trouble finding like minded tourist and we shared a taxi for the journeys there and back at a return cost of US$14 each. We wandered around the harbour front and shops and found Marigot fairly wheelchair friendly except for some parts of the market where there was a high step up into the central square. On our return we got dropped off in Front Street, the main shopping street of Phillipsburg, and headed for the beach front which is a long flat promenade fronted by frequent bars and restaurants. We did not visit the shopping streets but had a pleasnat time wandering along the beach front and back to the ship. We found Phillipsburg even more wheelchair friendly than Marigot. The pavement walk way back to the ship was no obstacle at all it being level and smooth with dropped kerbs. Tortola - Another place where the jetty is almost in town and another place we had been before. There is not a great deal to do here if you don't want to spend the day on the beach. We went shopping for Pussers rum and spent a happy hour sampling the product in Pussers Pub. A couple of "Painkillers" and a beer later we wandered back to the ship for lunch and some relaxation in the sunshine. Roadtown is flat and it is not too difficult to get around although there are some awkward spots if you want to visit the marina and its associated cafe/bar. It's much easier to get to Pussers Pub. Dominica - This was our second visit to this rugged island. This time we resolved to see a little more of the island than just the town of Roseau and once again found shipmates wanting to share a taxi and we obtained a 4 hour tour for US$30 each to the Emerald Pool via the west coast and the Layou River Valley, with stops at a Plantation and a local stall to sample local produce. At the Plantation we were shown the many crops grown there, limes oranges, bananas, cocoa, guavas etc, and had a chance to sample a few. The Emerald Pool is located in the rainforest National Park of Morne Trois Pitons and there was a charge of US$5 each to access the path to it. Before we embarked on the tour, we were told you could get a wheelchair to a view point but not down to the pool and waterfall which fills it. However on arrival we learnt even the view point was not accessible but having got there we were determined to try. It wasn't easy but we did do it. A well made path slopes down through the rain forest to the viewpoint which is about a 10/15 minute walk away from the entrance. The trouble is the path is split in places by rain gullies which must be crossed and there is the occasional single step and of course the return journey is uphill! The view point itself is not easily accessed with a wheelchair either. This was the only day we really encountered heavy rain to interfere with the holiday, fortunately we had come back from the walk down to the view point and were able to shelter until it eased. We ran out of the rain on the drive back down to Roseau and the sun was shinning on the coast when we settled down on the patio of the Fort Young Hotel for a drink or two before returning to the ship. St Vincent - The ship docks along side the jetty in Kingstown next to shear cliffs which trail lush vegetation down into the clear sea. This is another mountainous island. 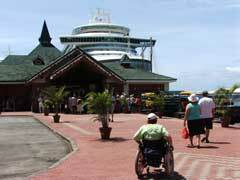 Going ashore is easy but once outside the small cruise terminal the going for a wheelchair user can be rough. We took a US$10 taxi ride uphill to the botanical gardens where we had a wander around one of the better Caribbean gardens. These are set on a hillside, it is therefore a little demanding of a carer getting around but, not wishing to do anything else, we had all day and spent a couple of relaxing hours idling away time before deciding to walk back downhill to the ship. Once back on level coastal terrain, we found a bar in a shady little courtyard and stopped for a well earned drink before venturing out into the street again and along the cobbled paving of the arcades back to the ship. SummaryWe thought Ventura a busy ship and whilst we enjoyed the cruise we felt the ship carried too many passengers for the facilities. Perhaps this is an attempt by P&O to keep the cost of cruising down. 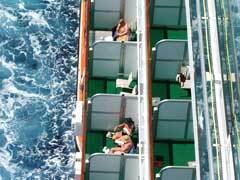 We would certainly hesitate to travel on this ship again without the excellent cabin with a balcony which we had. Here we could relax and soak up the sun instead of scrambling for space on a sun deck and playing dogems with the sun beds. 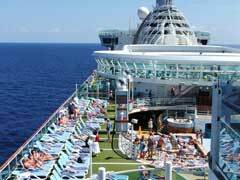 Obtaining a sun bed on sea days was next to impossible and the decks became very crowded. We also often found the self service buffets crowded particularly for breakfast and after the first couple of days stopped using them. We found it easier to have breakfast in the Saffron Restaurant even though we were on fixed dining in, the not so easy to access from our cabin, Bay Tree Restaurant. There was plenty of entertainment to suit all tastes but we thought this below the standard previously expericenced although there were a couple of exceptions. One good thing P&O have introduced since our last cruise with them is port guides for the disabled. These also detail any wheelchair accessible tours which can be made available and it is sent to you prior to your departure.